In some regions of France (particularly in the East and the North), the Christmas celebrations start on the 6th of December. It's the day dedicated to Saint-Nicolas, the saint who gave away his fortune to the poor and to children. His memory is celebrated by gift giving: kids receive toys and little chocolate statuettes on this day. There are also very local traditions, like the Feast of Light (la Fête de la Lumière) in Lyon, on the 8th of December. The citizens of the beautiful old town all place candles in their windows to honour the Virgin Mother, which creates a magical atmosphere. Most commonly, though, the French stick to the traditional timetable: Christmas Eve, Christmas Day and the day after Christmas. In some regions the celebrations go on till La Fête des Rois on the first Sunday of January - the French version of Epiphany, or the coming of the Three Wise Men. Children often go round from door to door on this day to sing songs and collect some coins in the process. If you're Catholic in France, you won't eat on Christmas Eve until you've been to the midnight mass. As soon as the religious ceremony is over with, the French dive into what they call "Le Réveillon", which literally means "The Awakening". It refers to becoming aware of the full importance of the holiday (the birth of God's son), but is more popular as a term to describe what could possibly be one of the best meals of the year - though the French are not exactly known for being underachievers in the kitchen. Even in France turkeys don't escape their holiday fate, but fortunately the French are not afraid to use their culinary imagination, either. So it is that in many regions geese and chickens or even capons are served, sometimes with beautiful local specialties like boudins (blood sausage). And there's no reason, of course, why the sheer joy should stop once the meat and its sides have all been polished off: the French do love themselves a bit of dessert! They have pretty good ones, too: the "Pain Calendeau", for example, is a gorgeously sweet Christmas loaf with dried fruits in it. 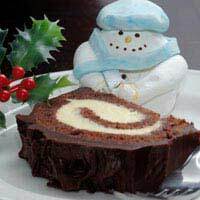 But the most popular is the "Bûche de Noël" (the "Christmas Log"): it's a cylinder-shaped cake made with rich amounts of chocolate and chestnuts. Generosity is a big part of the French Christmas tradition. The French give food to the poor (the aforementioned Pain Calendeau can never be eaten without sharing it with somebody who's down on his or her luck), and lots of presents to their children and to each other. Like in Spain, kids put their shoes in front of the fireplace - they do this on Christmas Eve, though, and leave out the straw. The shoes are then filled with gifts by "Le Père Noël", the French equivalent of Santa. A beautiful French Christmas tradition is that kids who write a letter to Le Père Noël actually get one back: the postal services make sure that all the notes are answered.